Unlike most package holidays that use hotels, safaris are based around lodges made from local materials with facilities that are easy to accommodate. There are many chains throughout East Africa, providing different styles and levels of comfort. As long as you do not expect them to be 5 star hotels you shouldn’t be disappointed. Anyway, you’ll probably be too tired to care about anything other than having a shower, something to eat and falling into bed! All lodges have large restaurants with separate bars, which in many cases are open-aired but covered. Service in virtually all is by waiter for at least your drinks, which are not usually covered by your accommodation. Food could be served from: buffet; fixed menu; or, a la carte. Your bedrooms generally have en suite bathrooms and often overlook the countryside. If you’re lucky you can even spot game from your bedroom window. All lodges have the compulsory gift shop, which also sells essential toiletries. Some lodges offer additional facilities, such as hairdressers, spa experiences, laundry facilities (check turn-round times suit your itinerary) and swimming pools. Lodges in this class usually cater for c. 10-20 people (rather than 150+ in some cases) and tend to be in the smaller or private game reserves. Accommodation is usually superior to the basic lodge with luxury rooms often in small bungalow blocks or 'bandas' and invariably good views over the surrounding countryside. Restaurant and bar facilities are more akin to family run hotels depending on the management's personal style. Most offer a range of activities from the usual safari (although you tend to get your own drivers, guides and vehicles), including escorted walks (with armed guard by prior arrangement), riding or camel safaris. Cycling, quad biking or even white-water rafting is available at some locations (check with your travel agent beforehand) for the more adventurous. You can often relax with a trained masseur, coached in meditation or undergo holistic therapies. 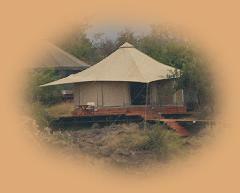 These are run on similar lines to the luxury lodges except they can often be found within the game parks. In many respects these are lodges albeit with canvas canopies. The general principal is that they can be removed after the operating license has expired and the grounds will return to their natural condition. The 'tents' are usually mounted on solid wooden platforms, have inner vanity curtains, single or double beds with mosquito nets and private facilities. 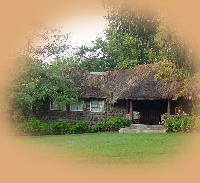 Ol Seki, outside the Mara. Typical camps have common dining facilities with individual sleeping tents spread apart for privacy. 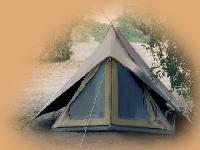 Each tent usually has its own washing, shower and toilet facilities. 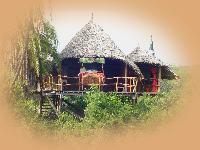 There are a wide range of camps within East Africa and a wide latitude must be given to operators' descriptions. One camp (not the one shown) described their accommodation 'spacious and luxurious tents'. We found them cramped with separate cubicles behind for the shower/wash basin and toilet. The shower had to be filled by the staff - so you had to order it in advance. The toilet had a seat but no flushing facilities - you covered your deposit with ash from the fire, handily provided in a bucket with a trowel! So question your travel agent carefully beforehand so you do not get any surprises on your arrival. A simple mistake such as this could taint your whole safari experience. The more adventurous back-packer may choose to pitch their own tent in the camps provided. You take what you get here. Usually the campsite is bounded by electrified fences to keep the larger game out ( but don't count on it - we had a visit by an old bull elephant on our only stay! ). The facilities can be best described as basic, with no shops for food or general supplies. Do NOT keep food or sweets in your tent as these attract the game! Some locations offer alternative accommodation, such as private houses or rooms for those seeking even more seclusion. The 'starbeds' at Loisaba are now being copied by others. These are run by the local tribesmen who maintain the facilities, cook your food and guard you at night. Your banda is mounted on stilts with an open-air verandah. The beds are mounted on wheeled carts, so you can sleep out under the stars if the weather is good and roll it back in if it rains or gets too cold. Not for bad weather!